It’s really almost there! 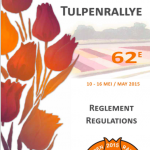 Yet a few nights and then launch the 61th edition of the Tulpenrallye. After a year of preparation we go on Monday, May 5th in Annecy start. The route seems to be completely free of snow and the weather forecast is about getting better every day. Now available: Fromanteel Limited Edition Tulip 61 watch. Every crew will also receive one unique limited edition ‘Fromanteel Tulip 61 Chrono’ watch (with a vlaue of 499 Euro), with the starting number of the crew engraved in it. This limited edition ”Fromanteel Tulip 61 Chrono’ is being produced in an edition off 500 units only. Competitors will have the privilege to purchase a second watch (also with the starting number engraved in it) at a reduced price until the start of the rally.